SustainabiliTank: Before Thanksgiving, Seton Hall University of New Jersey honors UNSG Ban Ki-moon and gives him the podium to make a re-election speech. Will the US fall for it? What effect will have North Korea Shenanigans? Before Thanksgiving, Seton Hall University of New Jersey honors UNSG Ban Ki-moon and gives him the podium to make a re-election speech. Will the US fall for it? What effect will have North Korea Shenanigans? At a time when for example the UN is accused of playing a role in the introduction and spread of cholera in Haiti, and has killed at least one Haitian demonstrator, one expected this issue to at least be mentioned in the major policy address. But Ban’s speech, as distributed under embargo to the UN press corps, did not even mention Haiti. Amazingly, Ban’s speech praised his and the UN’s role in Myanmar and went on that “We did the same in Darfur. For years, conflict raged… today, the mission continues to protect civilians.” This right after the slaughter at Tawila, which even Ban acknowledged raised issues about the UN peacekeepers freedom of movement and protection of civilians. Ban did not mention Sri Lanka, a country where he has been burned in effigy and where after tens of thousands of deaths, the International Crisis Group said the UN’s inaction should be investigated. Not a mention of the mass rapes in Eastern Congo, and the UN peacekeepers’ inaction. After each of these incidents, the UN has said it can and will do better. But this is soon forgotten, not even mentioned amid the self congratulation. At Monday’s noon press briefing, Ban’s acting deputy spokesman was asked if Ban would be receiving an honorary degree, as Seton Hall itself had been announcing since last week. Haq would not confirm it. But the speech, even as embargoed, began with thanks for the award. Great Communications system in place at the UN! By ROBERT MACKEY, a New York Times blogger. Korea Herald A screenshot from the Web site of The Korea Herald shows the location of Yeonpyeong island, in disputed waters. Updated | 5:21 p.m. The residents of South Korea’s Yeonpyeong Island, who rushed to air-raid shelters on Tuesday as they came under attack from North Korea, are well aware that they live on the edge of a geopolitical fault line. The island is in disputed waters claimed by both countries, just two miles from the so-called Northern Limit Line, a maritime border the North has never recognized, and only eight miles from the North Korean coast. Many of the island’s 1,600 civilian residents, mostly graying fishermen, said they felt caught in the middle. But they also say they are accustomed to the periodic escalations in tensions, which they describe as just another part of life on this disputed island. Most said they were determined to go about their daily work of running their crab boats or tending fish traps along the island’s rocky coast. As another colleague, Choe Sang-Hun, has explained, the Northern Limit Line — known to Koreans as the N.L.L. — is a reminder that the Korean War is formally on hold, not over. When the 1950-53 Korean War ended in a truce, rather than a permanent peace treaty, the warring militaries failed to agree upon a western sea border. The American-led United Nations forces unilaterally drew the Northern Limit Line, a border the South Korean and United States militaries have enforced since the end of the war. But North Korea never accepted it, insisting on a border far south of the United Nations line that cuts deep into waters currently patrolled and fished by the South. Since the line veers sharply to the north after leaving land, Pyongyang claims that it unfairly gives some of its waters to the South. The armistice agreement stipulates that the five islands are under South Korean control, but jurisdiction over the waters surrounding them is open to some interpretation. North Korea further argues that its vessels have regularly fished in the waters claimed by the South, and that since the 1970s it has claimed under customary international law a 12-nautical-mile territorial sea in the area, which extends well south of the N.L.L. North Korean fishing boats and naval vessels have crossed the N.L.L. several dozen times a year since the late 1970s. Reuters South Korean protesters expressed their support of the Northern Limit Line in 2007. The disputed maritime border has led to several clashes between the armed forces of the two Koreas in recent years. 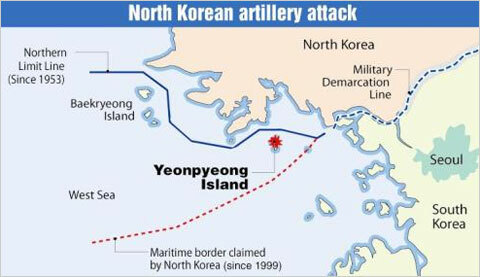 In August, after North Korea seized a squidding boat and South Korea carried out aggressive naval exercises in the area, the North fired 100 artillery rounds into the sea near Yeonpyeong. In March, an explosion sank the Cheonan, a South Korean Navy ship, in the same disputed waters. After the ship went down, killing 46 sailors, South Korea and a team on international investigators blamed a North Korean attack. The two Korean navies also clashed over the N.L.L. in 1999, 2002 and 2009. Before that, as Reuters reported on Tuesday, North Korea paid only fitful attention to the maritime border — not objecting at all until 1973 and then seeming to agree to recognize it in 1992. I think this kind of thing has been in the cards ever since the South Korean ship was sunk at the end of March, when the South Korean public basically broadcast its reluctance to retaliate militarily against North Korea…. The North Korean regime does not really have to worry so much about easing the way for the successor [to Kim Jong-il], the regime’s greater problem is, how does it justify the existence of this separate North Korea, when you have a thriving, an economically powerful South Korea next door. The only way in which it can do that, since it has failed so spectacularly on the economic front, is to bolster the public’s pride in the regime through shows of military strength and might. Earlier this year, Mr. Myers wrote, in an essay for Foreign Policy, that his study of North Korean propaganda suggested that the regime’s ideology was not really Communist, but rather, a kind of “paranoid nationalism” that is essentially “racist,” in its affirmation of Korean superiority. China Faces a Nettlesome Neighbor in North Korea. North Korea’s unending appetite for confrontation has complicated relations with China, its supposed patron. Interactive Feature: The North Korean Challenge. provoking the international community for survival.